Underoos were developed as a product idea in 1977 by an independent entrepreneur, Larry Weiss, who obtained licenses for the four major comic character groups (DC Comics, Marvel Comics, Hanna-Barbera, Archie Comics) which included Superman, Batman, Shazam, Wonder Woman, Supergirl, and Captain America. The product idea was first offered to Hanes, but was rejected. Scott Paper company pursued development, but ultimately decided to not market the product. Fruit of the Loom had been engaged as supplier of the blank underwear and another vendor engaged to apply transfers. Informed of Scott Paper Company’s decision to not market this novel product, Fruit of the Loom inquired if they would be permitted to market the product, now fully developed. 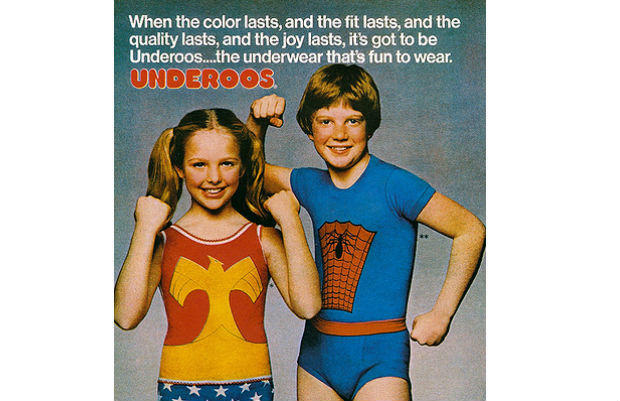 Weiss agreed, and in 1978 Fruit of the Loom bought Underoos. The product was tested in three markets including the New York Metropolitan area, and then quickly spread to national distribution.